The elegant and distinctive kate spade new york Cypress Point All Purpose Bowl features platinum banding and a cobblestone detail. Part of the Cypress Point dinnerware collection. Cobblestone accents on the bone china kate spade new york Cypress Point Bread & Butter Plate create a compelling dinnerware presentation. Bands of precious platinum round out the design from kate spade new york. This fine bone china accent plate features a delicate band of detail along the platinum-trimmed rim that's reminiscent of a cobblestone pathway. The fine china kate spade new york Cypress Point Soup Bowl bears a detailed cobblestone motif and platinum accents, creating distinctive and elegant dinnerware. Cobblestone accents on the bone china kate spade new york Cypress Point Dinner Plate create a compelling dinnerware presentation. Bands of precious platinum round out the design from kate spade new york. Cobblestone accents on the bone china kate spade new york Cypress Point Saucer create a compelling dinnerware presentation. Bands of precious platinum round out the design from kate spade new york. 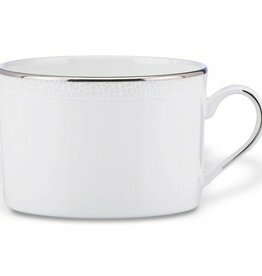 Cobblestone accents on the bone china kate spade new york Cypress Point Cup create a compelling dinnerware presentation. Bands of precious platinum round out the design from kate spade new york. Express the best of taste at the table with Cypress Point dinnerware from kate spade new york. Lustrous banded details give the 5-piece place setting a crisp, clean finish. Cobblestone accents on the bone china kate spade new york Cypress Point Salad Plate create a compelling dinnerware presentation. Bands of precious platinum round out the design from kate spade new york.